One thing that can make or break any halftime or competitive cheer routine is the cheer dance mixes and how well the routine goes with that music. Making sure that the music mix you choose matches the needs and personality of your school or cheer squad as well as being unique and clever can be a difficult task. There is a big difference between the type of music you might need for a dance routine performed for fans at a ball game and the music you'll need for a competitive squad dance routine. Competitions often have time limits, so that will impact the type of music that you choose. You'll also want to make sure that the transitions from one song to the next are smooth and on beat. For example, you don't want cheer at a high paced, energetic clip only to have the music suddenly drop to a slow beat or vice versa. It will only serve to make the routine look jerky and awkward, and this is one of the last things you want in the middle of a competition. You'll also want to choose cheer dance mixes with songs that haven't been over done. Songs like "Get Ready for This" by 2 Limited and "Rock This Party (Everybody Dance Now)" by Bob Sinclair have been performed ad nauseum. A cheer music mix that you'll use for halftime performance at your school basketball or football game can be fun and funky without the worries of time and transition concerns you'd have with competition music. However, if your squad competes as well, you may want to utilize your half-time performances as practice for your competitions. The best preparation for performing in front of judges is performing in front of any audience, including school sports team fans. There are many ready-made mixes that can be used for school halftime programs. Sometimes your squad may just want to have fun together and goof around, try out new skills and dance moves. A CD of favorite songs of squad members is perfect for this purpose. Try out new things, and you may be surprised at what you'll come up with that can be used in your next competitive routines with cheer music mixes containing popular music beats. 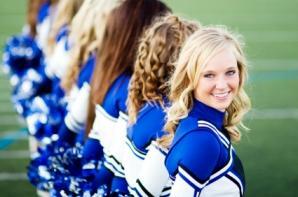 Custom Cheer Mix - You'll find a ton of testimonials on this site to testify how much squads love these mixes. You'll also find many different samples to get a taste for the quality and flavor of their mixes. Cheerleading Music Mix- This company will let you choose the songs you want, and you can even add in some voice overs. You can even make one free revision to make sure you love the mix of music you've chosen. CustomMixes.com- This company offers both pre-made routines/mixes and custom music mixes. Is your squad on a budget? With today's technology and the use of some simple and free MP3 editing software like Audacity, you can easily create your own custom music mix for your squad. While the quality isn't likely to be good enough for a competition, it should be fine for routines during games or for fun. Another option is to work with the radio station at your school to create a more professional mix of music and voice overs.